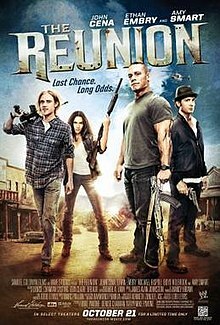 After the death of her father, Nina (Smart) is charged with fulfilling his last wish – bring her three brothers back together… Sam (Cena), a hardened cop currently on suspension; Leo (Embry), a loud-mouthed overbearing bail bondsman; and Douglas (Holbrook), a handsome 20-year-old thief fresh out of jail . When Leo discovers the con he pledged a lot of money for is suspected of kidnapping one of the wealthiest men in the country, he convinces his two brothers to join him on what will become a dangerous, yet exhilarating adventure. WWE Studios produced the film alongside Samuel Goldwyn Films. Filming took place in Albuquerque, New Mexico in October 2010. The film was released on Blu-ray and DVD on November 8, 2011. The film received negative reviews. Rotten Tomatoes gives the film a score of 8% based on 12 reviews, and average rating of 3.3/10. This page was last edited on 20 October 2018, at 11:12 (UTC).